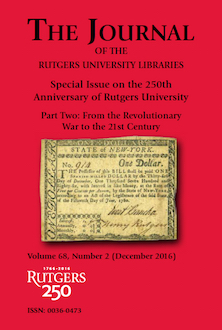 Articles of scholarly merit based on the holdings of the Rutgers University Libraries, and in the areas of New Jersey history, Rutgersensia, bibliography, and the history of libraries, books and printing, will be considered for publication by the editor of The Journal. Address all communications to: Journal of the Rutgers University Libraries, Archibald S. Alexander Library, Rutgers, The State University of New Jersey, 169 College Avenue, New Brunswick, New Jersey 08901-1163. Please send e-mail to: JRUL-editor@libraries.rutgers.edu.